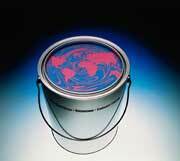 Welcome to Eastman Chemical Company's Storefront on Paint and Coatings.com! This Storefront is your gateway to information about Eastman Chemical Company, our products and our services. Eastman supplies billions of pounds of products for countless end uses by consumers. Recyclable plastics and antioxidants from Eastman help keep foods and beverages fresh. Eastman raw materials form the basis for waterborne coatings and inks, and water-based cosmetics, hair spray, and nail polish. We invite you to search our online catalog and purchase the products that fit your needs. Eastman materials find use in manufacturing products for conventional and higher solids solvent-based, water-based, powder and UV curing technologies. The broad product offering means Eastman products are used in every coatings and inks application end market: automotive OEM coatings, wood coatings, auto refinish, coatings for plastic, coil coatings flexographic printing, retogravure printing and many others. Eastman Chemical Company (Kingsport, Tennessee) is a leading international chemical company that produces plastics, chemicals, and fibers. Since the early 1930s, Eastman Chemical Company has served the coatings and ink- making industry with high-quality products. 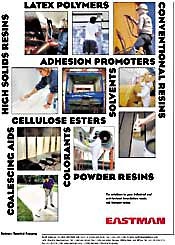 Eastman offers a comprehensive product line based on a variety of raw materials, and the company is a leader in cellulose esters, solvents, resin intermediates and specialty additives used by manufacturers. In September 1998, Eastman purchased Ernst Jager, Fabrik Chemischer Rohstoffe GmbH & Co, a German manufacturer of specialty polymers. Jager provides Eastman's first manufacturing plant in the European region dedicated to the supply of specialty polymers to formulators of coatings, supporting Eastman's waterborne products effort. Taking another significant step in pursuing growth opportunity in specialty chemicals, Eastman purchased Lawter International in June 1999. The acquisition brings together complementary technologies that will enhance global capabilities, innovation and ultimately benefit the industry. Lawter will focus on the ink business. Local representation and technical service facilities are located in Kingsport, TN; Kirkby, UK; and Singapore.